This dainty 2.5" x 2.5" heart shaped box has clear crystals outlining the heart shape cover of the box. The finish is brushed and will not tarnish. The cover lifts off the box and the inside cover are lined with a dark blue flocked cloth. This classic 2.5" x 2.5" x 1" H box is heart shaped. The cover lifts off and the inside cover and box are lined with a dark blue flocked cloth. This luminous 4.25" x 4.25" x 1.5" star shaped box is plated with nickel to give the box a shiny silver look that will not tarnish. The cover lifts off and both the cover and inside of the box are lined with blue flocked cloth. Monogram can be engraved (optional) on the cover to personalize this gift. White gift box. 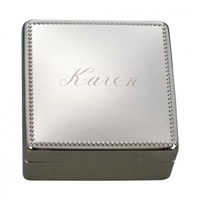 This charming 3.25" square shaped box is nickel plated to give the box a shiny silver look that will not tarnish. The cover lifts off and edges are beaded to give it just a touch of glamour. The inside of the box is lined with a dark blue flocked cloth. The cover offers plenty of room for optional personalization with a 2.75" square area within the beaded edge. Gift boxed. 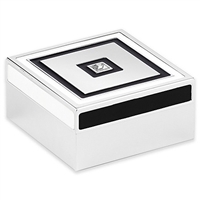 This 4" square box has an antique silver finish with lacquer to prevent tarnishing. The cover is hinged, and has a plain area in the center that can be used to engrave a special message, monogram or initial. The cover and box have a dark blue flocked cloth lining. 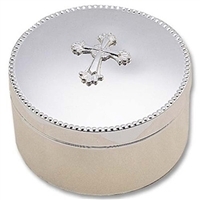 This stylish 5.25" x 3.75" x 1.75" H box is plated with nickel for a bright shiny finish that will not tarnish. The cover is hinged and has a beaded design along the cover edges. The cover and box are lined with a dark blue flocked cloth. Perfect unisex box. A silverplated velvet lined interior keepsake box. In chic contemporary style, the elegant kate spade new york Garden Drive Red Square Jewelry Box shines in exotic Red lacquer. A gold toned metal medallion decorates the front of the box, complete with the kate spade new york spade icon. A perfect size for special jewelry items or keepsakes, this lovely kate spade accent box makes a wonderful gift. In chic contemporary style, the elegant kate spade new york Garden Drive Pink Square Jewelry Box shines in exotic pink lacquer. A gold toned metal medallion decorates the front of the box, complete with the kate spade new york spade icon. A perfect size for special jewelry items or keepsakes, this lovely kate spade accent box makes a wonderful gift. Reed & Barton keepsake box from the Abbey collection. Cross debossed at top with bead pavé edge. Since 1824, Reed & Barton has been renowned for its fine silver. Recognized for design excellence and the highest quality workmanship, Reed & Barton now offers a wide array of exceptional products including dinnerware, flatware, crystal, and giftware to satisfy a broad range of tastes. 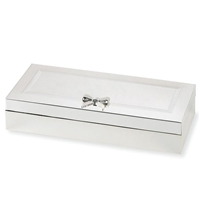 The lid of this silver-plated vanity box bears a sculpted grosgrain ribbon and bow. Store special keepsakes in this decorative box, or give the box as a lovely gift for any occasion. 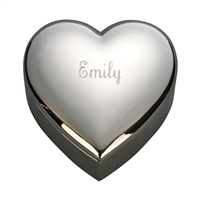 Hearts on the outside and a ballerina on the inside makes this metal jewelry box a perfect gift for every little girl. Lined in pink with compartments for all her favorite things. Plays "Für Elise" as the ballerina turns. Lenox updates décor with the sophisticated glamor of the Piano Collection. 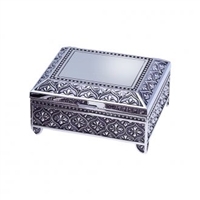 Crafted of beautiful silver plate, the Piano Small Box adds a sparkling accent to your vanity. It boasts gorgeous black highlights and is embellished with a chic, square crystal. In chic, contemporary style, the kate spade new york Garden Drive Large Rectangle Jewelry Box shines in pink. A gold toned metal medallion decorates the front of the box, complete with the kate spade new york spade icon. A perfect size for holding special jewelry items or keepsakes. In chic, contemporary style, the kate spade new york Garden Drive Spot Large Rectangle Jewelry Box shines in white with black spots. A gold toned metal medallion decorates the front of the box, complete with the kate spade new york spade icon. A perfect size for holding special jewelry items or keepsakes. In chic, contemporary style, the kate spade new york Garden Drive Large Rectangle Jewelry Box shines in turquoise. A gold toned metal medallion decorates the front of the box, complete with the kate spade new york spade icon. A perfect size for holding special jewelry items or keepsakes. The perfect gift for the young woman who has it all, the Bella Jewelry Chest from Reed & Barton showcases divided compartments and hooks for storing rings, bracelets and chains. Part of the Small Wonders Jewelry Chest Collection, this jewelry box features a white finish contrasted against a hot pink interior of flocked velvet.